Fiorello Henry LaGuardia (December 11, 1882 - September 20, 1947) was the 99th Mayor of New York for three terms from 1934 to 1945 after having been previously elected to Congress in 1916 and 1918, and again from 1922 through 1930. Irascible, energetic, and charismatic, he craved publicity and is acclaimed as one of the three or four greatest mayors in American history. Only five feet tall, he was called "the Little Flower" (Fiorello is Italian for "little flower"). 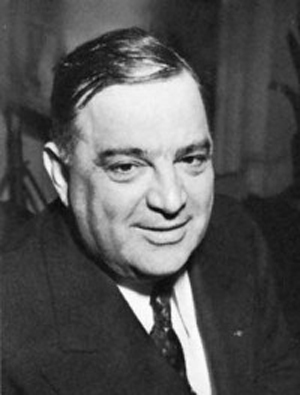 LaGuardia, a Republican who appealed across party lines, was very popular in New York during the 1930s. As a New Dealer, he supported President Franklin D. Roosevelt, a Democrat, and in turn Roosevelt heavily funded the city and cut off patronage from LaGuardia's foes. LaGuardia revitalized New York City and restored public faith in City Hall. He unified the transit system, directed the building of low-cost public housing, public playgrounds and parks, constructed airports, reorganized the police force, defeated the powerful Tammany Hall political machine, and reestablished merit employment in place of patronage jobs. I think the reporter should get his facts straight before he distorts them. It makes no difference if I burn my bridges behind me- I never retreat. Let's drive the bums out of town. My generation has failed miserably. We've failed because of lack of courage and vision. It requires more courage to keep the peace than to go to war. The Devil is easy to identify. He appears when you're tired and makes a very reasonable request which you know you shouldn't grant. To the victor belongs the responsibility of good government. We have had two chickens in every pot, two cars in every garage, and now we have two headaches for every aspirin.